“The King of wines, the wine of Kings”. There is no better way to describe one of the greatest wines in the world. Made from Nebbiolo grapes – grown on these lands since the 13th century -, the oldest record of the designation “Barolo” dates back to 1730 in London, on a goods shipment invoice to the British Ambassador from the Kingdom of Sardinia. Originally a sparkling sweet wine, Barolo changed characteristics halfway through the 1800s thanks to new winemaking techniques introduced by Camillo Benso di Cavour and Giulia Colbert Falletti Marquess of Barolo. During the day we will reach the heart of the production area: the slopes surrounding Monforte d’Alba, La Morra, Barolo and Serralunga d’Alba. 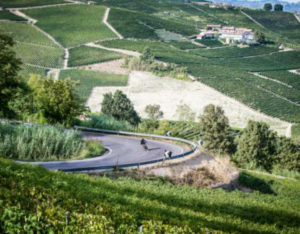 A winding route featuring long climbs and descents through vineyards and medieval hamlets, surrounded by the Langhe’s unique sea of hills. We will visit the place where Barolo was born and we will sample it in a renowned wine cellar guided by a master sommelier. On our way we will enjoy panoramic views, glimpsing medieval villages and ancient castles. And we will be having lunch in an important place in the history of Italy, where the chef will have a surprise in store for us. The leg will end in the late afternoon, and then we will enjoy a drink inside a beautiful garden to celebrate a great day. Legend has it that once upon a time the lands between rivers Tanaro and Stura were ruled by despotic and violent tyrants. Tired of being oppressed, the local feudatories decided to free themselves, reached an agreement, and decided to build an impregnable fortress. But the sandy bottom of the plateau made the endeavour impossible, as it was necessary to raise and remodel a significant part of the landscape. It was then that the Devil himself rose from the waters of the Tanaro with a deal for the local people: a fortified village in exchange for human souls. The inhabitants gathered and after heated discussions accepted the offer: nothing could be worse than their oppressors! 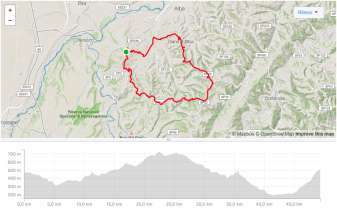 The Devil then took up a spade and within a day and a night reshaped Roero’s hills and canyons. 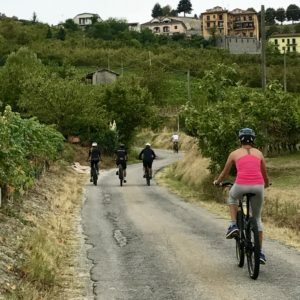 On this day we will be travelling through one of Piedmont’s most interesting geological sites, the bed of an ancient sea which once covered the Padan Plain. It was a seabed 250.000 years ago, currently home to very different microclimates just a few miles from one another: dry woodlands on the ridges – locally known as Rocche, but lush and damp in the underlying canyons, often over 100 meters deep. 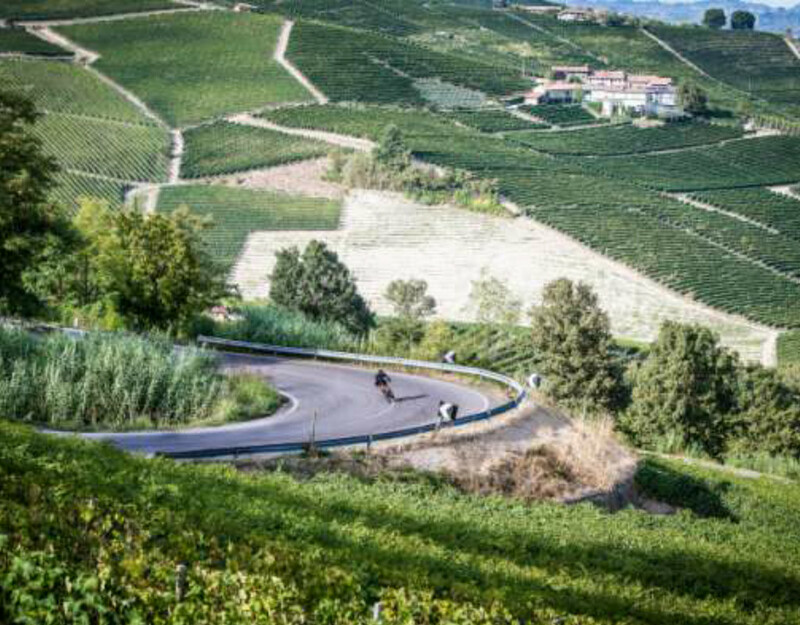 We will bid farewell to the Langhe after their warm welcome and move towards Monferrato, another great wine-producing area in Italy, home to Moscato spumante and Barbera. In the morning a nice ride we will lead us to the area where Barbaresco is produced, overlooked by Barbaresco itself, the village that gave its name to this prestigious wine. In ancient times these lands were called “Barbarica Silva” and were inhabited by the Ligurian people. 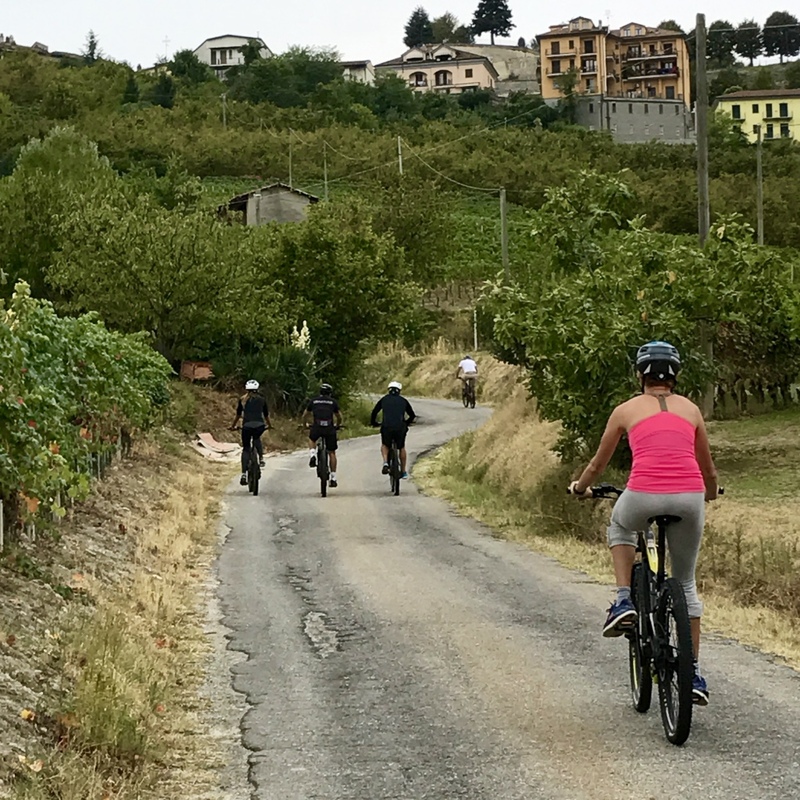 The Romans could never completely subjugate this community which built its village on the hill where the small village of Barbaresco currently stands. We will take a break here to visit its peculiar wine cellar and enjoy a light lunch in a typical inn close by. 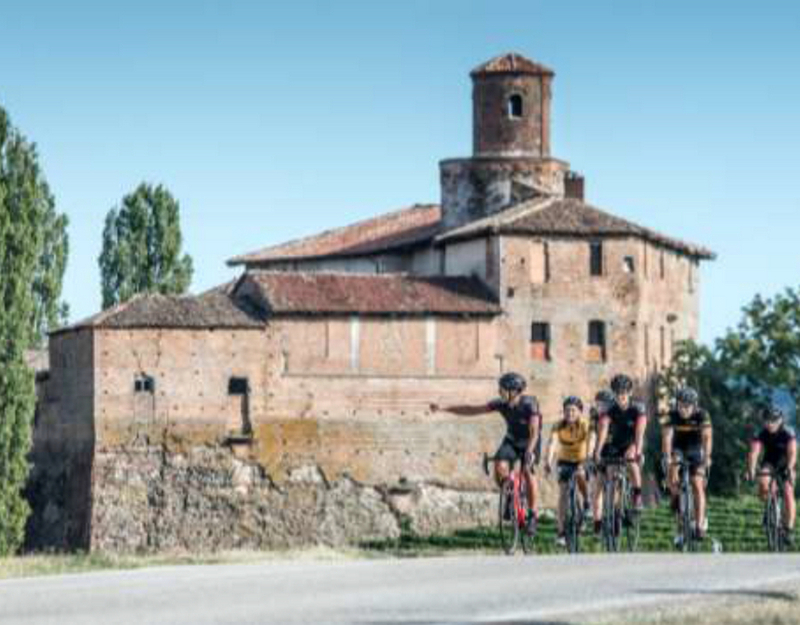 The route will then take us along flat lanes through the Monferrato Astigiano, an easy ride leading us over a couple of hours to a beautiful place: a 19th century villa with a SPA. A relaxing afternoon will follow featuring wellness programs, jacuzzi pools, cold waterfalls and drinks in the garden.